Mambo! My name is Sarah Anderson. 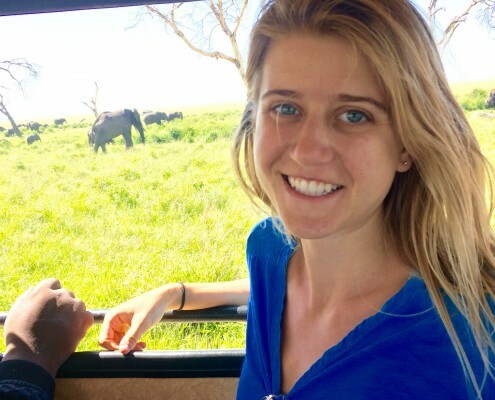 I am currently an undergraduate student, and last semester, I studied abroad on SIT’s Wildlife Conservation and Political Ecology program in Tanzania.When I first arrived in Tanzania in January, the short rains had not come yet. Ndarakwai, the ranch where my orientation took place, was in a serious drought. What I still very clearly remember from this time is the dust. I woke up with the taste of it in my mouth. It was always in my hair, and when I wiped my face, the cloth was red. 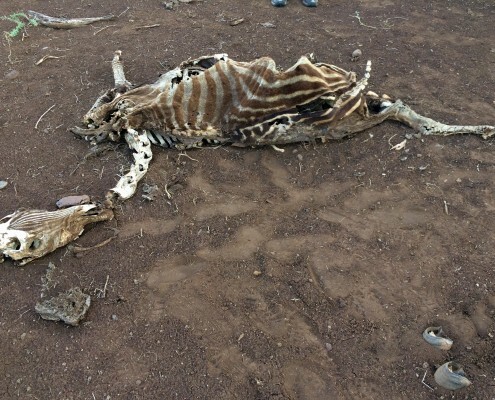 We also saw the skeletons of animals who had likely died from thirst – a perfect zebra skeleton, a lion skull, a tiny bat, wings spread. I saw the drought in the ribs of the cattle being herded by the side of the road. A few weeks later, our program went to Lake Manyara to study. In this park, there is a steady source of groundwater. There are streams and forests. It was lush and green, such a stark contrast to the water-deprived areas we had seen. I was struck by how radically water has the power to shape an ecosystem. I knew it was what I wanted to study. I had already witnessed the ecological effects of drought, but I wanted to know more about how this issue affects communities. At my home university, Colgate, I am a biology major and a creative writing minor. I have always been really passionate about writing and knew that I wanted to incorporate it into my project. How could I combine water and writing? I decided on storytelling. In recent years, especially through podcasts like The Moth and Beautiful Anonymous and the Internet phenomenon Humans of New York, storytelling has been rising in popularity. Especially storytelling in activism. When people can connect a name and a personal story to an issue, they tend to care about it more. I am a huge fan of story-based organizations. I decided I wanted to do a project like that, a sort of StoryCorps Tanzania. I would conduct interviews with people about how access to water affects their life and then make a creative nonfiction piece out of them. When I pitched this idea to my academic advisor, Maji Safi Group was immediately recommended. Over the years, Maji Safi Group has graciously hosted many an SIT student, and MSG’s work was a perfect fit for my idea. 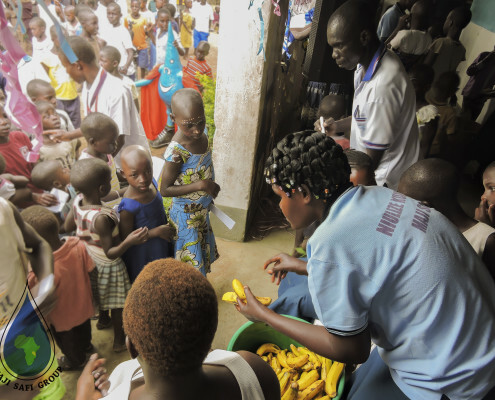 Community Health Worker Lilian Kayuni handing out bananas to the children after they washed their hands. On my first morning at the MSG office, I was a little bit nervous, not knowing what to expect. Upon arrival, I was immediately overwhelmed by the kindness and warm welcome I received from everyone I met. Over the next few weeks, I had the privilege of going along on all of MSG’s programs. One of my clearest memories is riding in the van and pulling up to a school for the Female Hygiene Program while hearing dozens of small voices excitedly screaming, “MAJI SAFI! MAJI SAFI!” I heard them again on the community outreach programs and pretty much everywhere we went after that. It was clear to me that Maji Safi Group holds a special place in the community. During my project, I interviewed a variety of people throughout the community, each of whom MSG helped connect me with. I interviewed some of the Community Health Educators about their role as educators and also their experiences as community members; women in the surrounding rural communities; water carriers, whose job is to bike and deliver water from the hospital and from Lake Victoria to people’s homes; the former chair of the water committee; and fishermen. Though my goal was to collect interesting and powerful stories, I was constantly taken aback by the intensity of the stories that I got. I knew that water was a critical issue in the region, but I do not think I had any idea of the depth and breadth of it until working with Maji Safi Group. Here are some of the stories that I heard. I think they are unforgettable, and I hope you will think so, too. 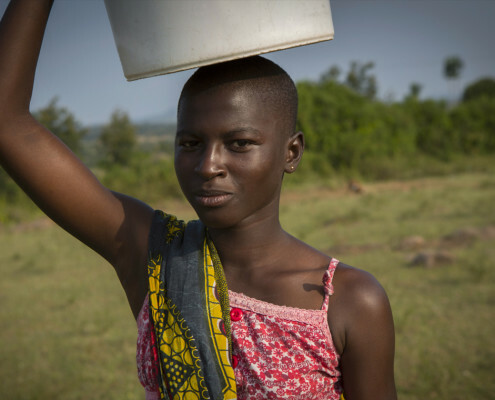 One educator told me about her experience gathering water as a teenager. For six years, she would wake up at 3 a.m. to collect water for her family before school started at 6 a.m. She did not complain about this at all, only admitting how difficult it was when I asked. 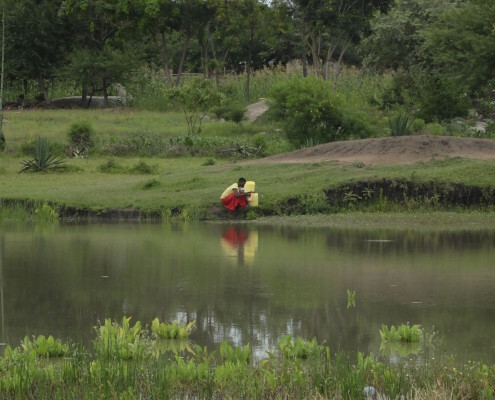 Another educator, when I asked her to tell me a story about water, told me a story she has witnessed through her work in the community: A woman has her period, and she needs water to wash, but her husband wants to take a shower and get his clothes washed. The Lake is far away, and she can only bring one bucket. By the time she uses water to wash herself and the clothes, there is not enough for his shower. “So he beats her,” she said, unflinching. The link between female hygiene and water is something I had not fully considered before my work with Maji Safi Group. I interviewed a water carrier who was 21 years old, one year older than I am, and who worked 11 hours every day, from 6:30 a.m. to 5:30 p.m., biking with water. 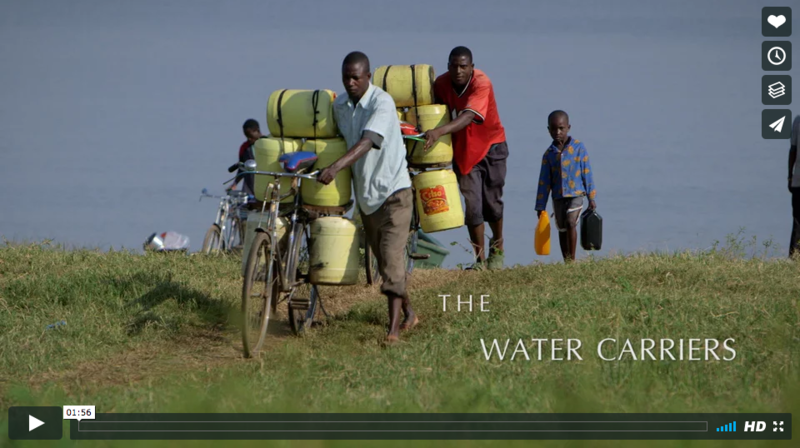 Each biker carriers five drums of water, 20 liters each, for a total of 100 liters. Such a load weighs 100 kg, or in total 220 pounds. Let that sink in. All day long, biking long distances with 220 pounds of water. The intense physical demands for this job are the reason why there are no female water carriers. I found this interesting, because in the home, it is traditionally exclusively a woman’s job to fetch water. However, the monetized equivalent of this work is only available to men. I interviewed a man who was a fisherman for many years. He only became a fisherman to earn money for his education and achieve his dream of finishing high school and then coming back to help his community. He and his older brother were divers on Lake Victoria. They would dive down and use nets to catch tilapia. When he was 19 and his brother was 22, his brother drowned. They both dove down together. He came back up to the surface, but his brother did not. He described it to me like this: “The loss destroyed everything.” After his brother died, he stopped fishing. Now, he is a community educator for Maji Safi Group. We also talked about what it is like to have your period during these times. You use just a little bit of water to wash yourself, so you do not smell, and you dump your clothes, she told me. “Do you still have to go and fetch the water?” I (somewhat stupidly) asked. “There is no one else who will go,” she said. Sometimes, these stories were hard to hear, but I think they are so important. In the United States, particularly on the East Coast where I have lived my entire life, water is a cheap and abundant resource. It is not something most people think about often. In Tanzania, it is something many people need to think about every single day and spend hours acquiring. It is difficult to imagine something so far outside of our own experiences, and this is why story sharing is critical. During my time in Shirati, I was continuously amazed by the work that Maji Safi Group does – by the wide range of programs they run within the community to reach huge numbers of people, by the creativity of the programs, and by the commitment and passion of everyone working there. I had a lot of fun working with MSG, and it was an experience I will not soon forget. I am so grateful to Maji Safi Group for supporting me throughout my project and connecting me to the community members. The work that they do every day is nothing short of inspiring. So, ASANTE SANA to Maji Safi Group! Ningependa kurudi tena. The Sustainability, Energy & Environment Complex at my alma matar was already filled with exciting displays and buzzing with participants when I arrived at the fifth annual Water, Sanitation and Hygiene (WASH) Symposium at the University of Colorado at Boulder last month. The passionate students at the Mortenson Center in Engineering for Developing Communities are the organizers of this impressive and growing conference that is free to the public. In addition to great panel discussions, presentations, and breakout sessions, the WASH Symposium features delicious food, a wonderful reception, and the great tradition of a closing happy hour at a Boulder restaurant. It is exciting for Maji Safi Group (MSG) to have this two-day conference in our own backyard, enabling us to network and discuss changes in the WASH sector with highly qualified professionals from around the world! For me, it was two days of enjoyment and inspiration. 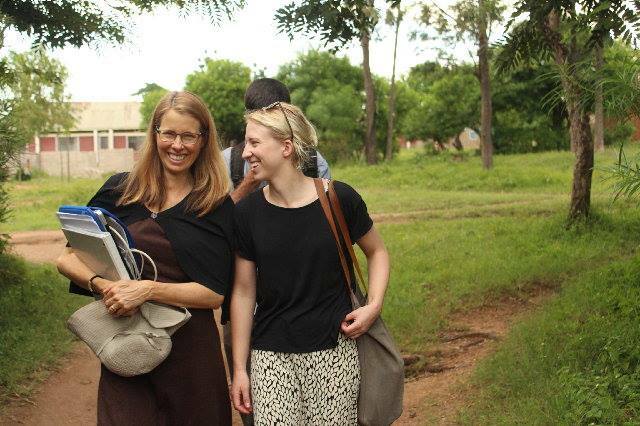 Professor Beth Osnes and PhD student Chelsea Hackett after a training with the Community Health Educators in Shirati, Tanzania. This year, Maji Safi Group was excited to facilitate one of the breakout sessions together with CU Associate Professor Beth Osnes. 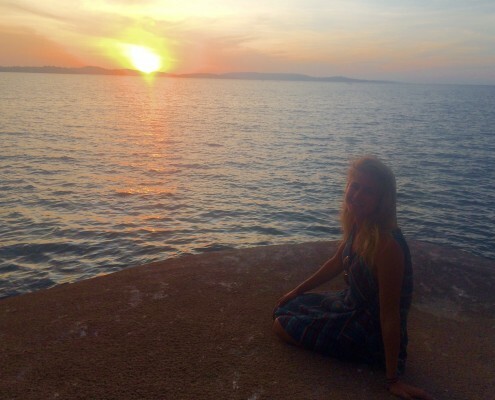 During the summer of 2016, Beth spent three weeks with Maji Safi Group in Shirati, Tanzania, where she shared her passion for using applied theatre as a tool for women’s empowerment with our Community Health Educators. At the WASH Symposium, we presented on Participatory Methods for Disseminating Vital WASH Health Messages and taught our audience how to create “cliff-hanger dramas” that catalyze community involvement in solving difficult dilemmas. It turned out that we had some fun and quite talented actors in the audience. Laughter and applause were plentiful when the four volunteers performed an impromptu skit that examined the dilemma of a married couple wanting to raise pigs on their property to gain income and status in the community, but doing so would pollute a valuable shared water source. It was a display of personal gain versus consciousness of community health at its finest. 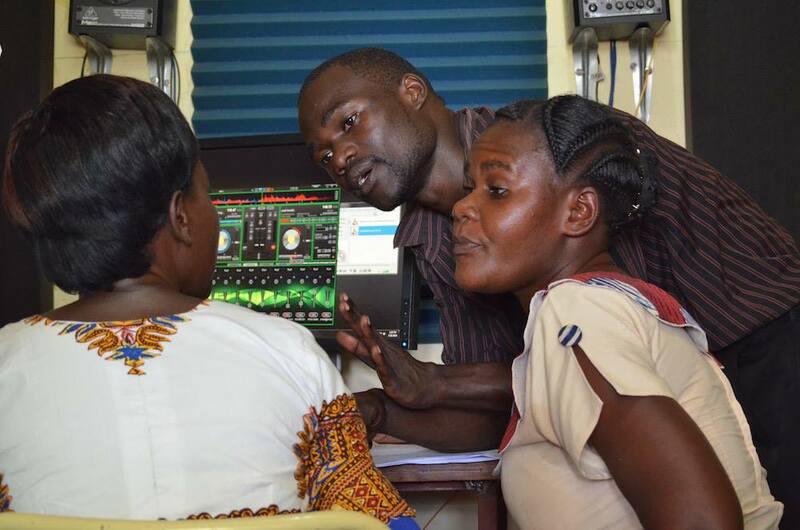 Community Health Educators Lilian Kayuni and Freddy Wawa along with Female Hygiene Expert Linda Arot performing a “cliff-hanger drama” about menstrual hygiene management on the radio in Shirati, Tanzania. Programs identify and mobilize the local stakeholders that can empower communities to change themselves. Programs work together with the government and local partners towards a long-term vision and sustainable solution. Programs build the capacity of local leaders and community members to facilitate getting people to pay for WASH products and services. Improved health is not always the main motivator for an individual to make behavioral changes; it is also very important to talk about gaining prestige in the community (as seen in the skit above). In behavioral change campaigns, it is vital to identify people’s determinants relative to their social position and income level and use these to identify their main motivations. Behavioral change is not only a question of knowledge, but also a supply chain issue. It is important for the private sector to get more involved in changing the global WASH crisis through making WASH products available and affordable. It is important for beneficiaries and supporters to visit successful projects and feel the impact personally, so they can properly advocate for models that achieve sustainable change in line with their mission. iDE’s model for marketing sanitation and combining Salesforce with streamlining supply chains for latrine construction in Southeast Asia was noteworthy. This market-driven approach is innovative and effective in making sanitation more available in developing countries. PLAN International’s presentation by Darren Saywell on the implementation of Community Lead Total Sanitation (CLTS) highlighted the importance of ‘natural leaders’ in creating effective changes in communities and making those changes sustainable. When teaching about sanitation, it is important to talk about defecation in a broader sense than individual behaviors. Without understanding the effect community-wide habits have on public health, one cannot properly advocate for sanitation and get people to make personal changes. It is very important that the WASH sector moves towards models of self-supply, because studies have shown that giving people free products and services is not sustainable. There is an ongoing debate on the effectiveness of subsidies for products and services in WASH. 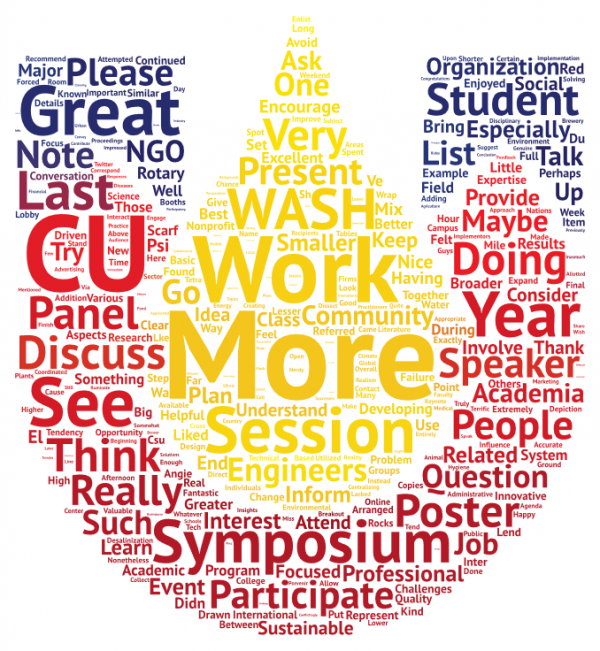 I would like to thank the organizing committee for their dedicated effort to bring WASH professionals and awareness to Colorado as well as the CU at Boulder Engineering School for supporting this annual gathering. Since I first attended this WASH Symposium in 2013, it has been amazing to see the improvements from year to year and the increased attendance. Maji Safi Group is very excited about attending again in March 2018, and we will continue to do our part in the collaborative effort of solving the global WASH crisis and preventing disease!